Jack McCaffrey, Brian Fenton and Ciaran Kilkenny have been recognised for their stunning showings this year. A trio of All-Ireland winners from the capital are in the running. THERE WILL DEFINITELY be a Dublin winner in the 2018 Footballer of the Year race after three members of the triumphant All-Ireland side have been nominated for the accolade. Defender Jack McCaffrey, midfielder Brian Fenton and forward Ciarán Kilkenny are the trio in the running for the honour which is part of the 2018 GAA-GPA PWC All-Star awards. The winner will be the fifth Dublin footballer to claim the award with McCaffrey one of the former recipients after his exploits in 2015. Bernard Brogan (2010), Alan Brogan (2011) and Michael Darragh MacAuley (2013) are the other Dublin players to have landed the individual prize. McCaffrey’s nomination caps a remarkable personal revival after he tore his cruciate in the early stages of the 2017 decider but bounced back this season to become central to Dublin’s success once more and won the RTÉ Sunday man-of-the-match award after the recent final victory over Tyrone. The Clontarf man is joined in the running by Raheny’s Fenton and Castleknock’s Kilkenny, who both will have strong claims for the award after superb showings throughout this season’s championship. Both Fenton and Kilkenny were nominated for the award in 2016 but Mayo’s Lee Keegan emerged as the ultimate winner. It is the first time since 2015 that Dublin have had all three nominees in the Footballer of the Year battle. It also signals the stature of the trio, who were all All-Ireland U21 victors in 2014, in the Dublin senior ranks as they have progressed rapidly. The nominees were decided by a committee made up of GAA media and chaired by GAA President John Horan. The award will be voted on exclusively by inter-county players. 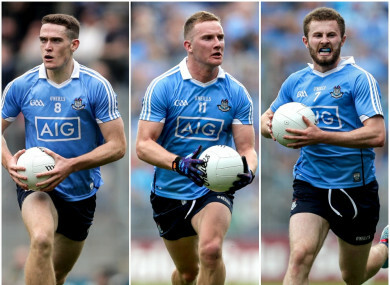 Email “Dublin trio nominated in battle for the 2018 Footballer of the Year award”. Feedback on “Dublin trio nominated in battle for the 2018 Footballer of the Year award”.